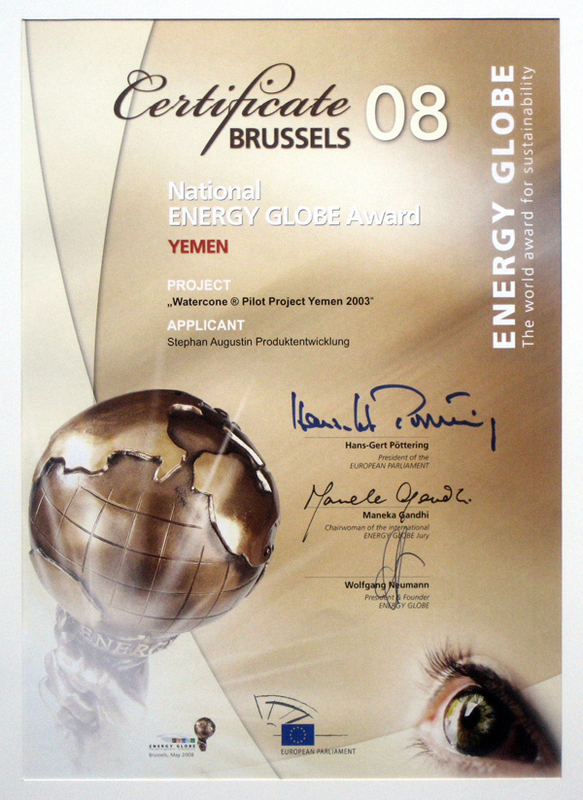 It is an honor to announce that the International Jury of the Energy Globe 2008 has judged the Watercone® submission as the national winner for the pilot project in Yemen. in the European Parliament in Brussels. 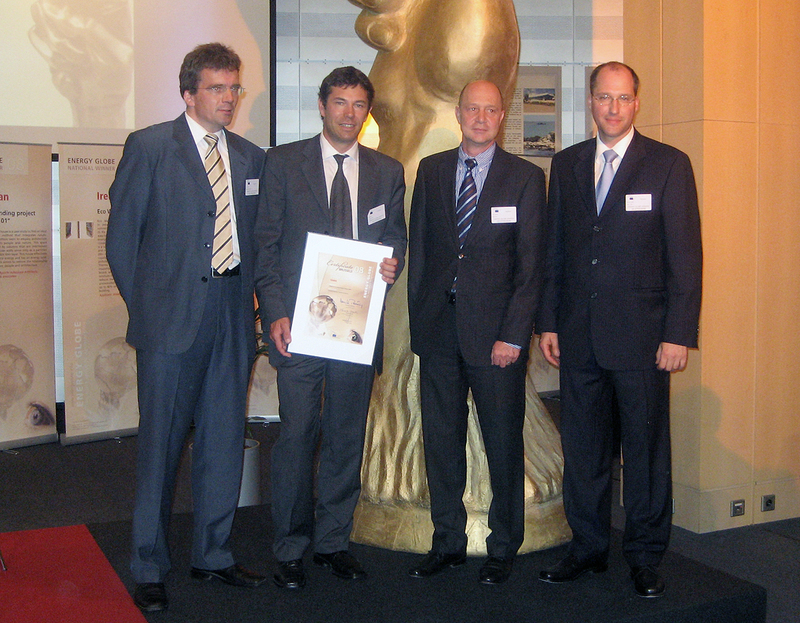 It is a pleasure to inform you I now found a new partner in spring 2008, the Mage-Watermanagement GmbH from Munich Germany. 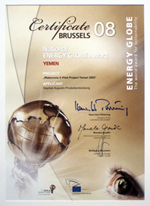 The company licensed the Watercone® and will start cost effective mass production and world wide distribution in 2009. 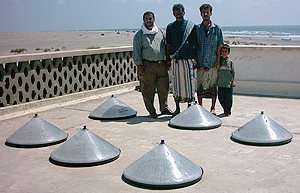 The Watercone® is a solar powered water desalinator that takes salt or brackish water and generates freshwater. It is simple to use, lightweight and mobile. The technology is simple in design and use and is discribed by simple pictograms. 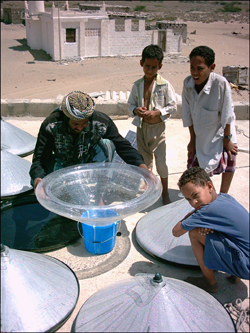 With up to 1,7 liters (nearly 2 quarts) in 24h the Watercone® is an ideal device to cover a child`s daily need of freshwater. 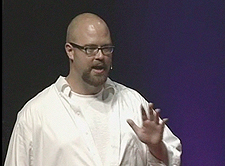 UNICEF: "every day 5000 children die as a result of diarrhea coused by drinking unsafe water"
Listen to Axle Steffen at the TED conference 2005 talking about his Book WORLD CHANGING and mentioning the Watercone® as an exceptional product during his talk. From Jan. 25 on until end of March 2004 CARE Germany tested 100 Watercones in Yemen in a little fisherman`s village east of Aden. To see more pictures and read the extract of the 26 page CARE report with its final conclusion click here.This pilot project could only be realized with the financial support of the Hans-Sauer-Stiftung in Munich. The Watercone® is travelling arround the world for testing. At lake Aral the problem of low waterlevel causes a salinisation of the land and ground water. 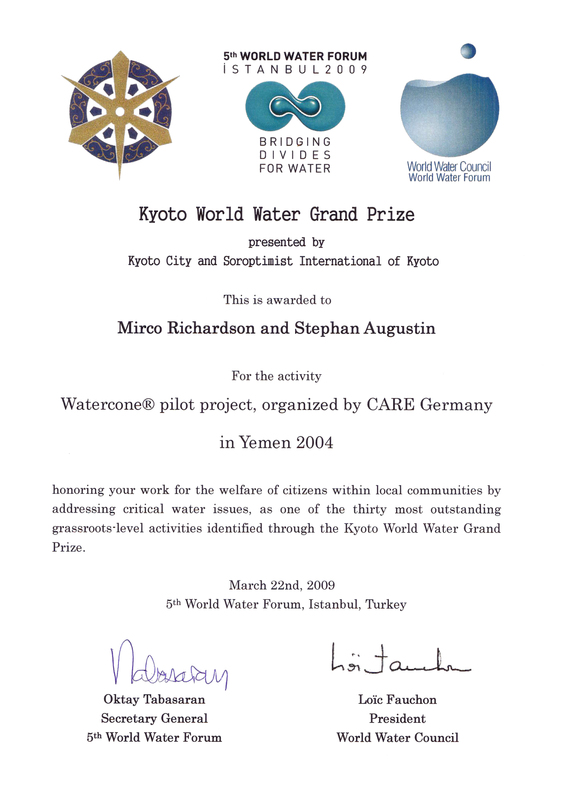 The Watercone has been tested successfully in 2005 and will be tested again.